You’ve heard about the perched villages of Southern France, the hill towns of Tuscany like the famous Montepulciano. Welcome to Sicily’s mountainous village of Caltagirone. If Tuscany and the South of France exude a certain ethereal quality, a repose in which the fine things of life are to be found, Caltagirone looks like something between a beehive and a extraterrestrial orbiter in which spacecraft are continually docking. Take the overcrowded tenements of Manhattan’s Little Italy and spread them over the surface of an enormous sphere and you will have an idea of what Caltagirone seems like at first sight. 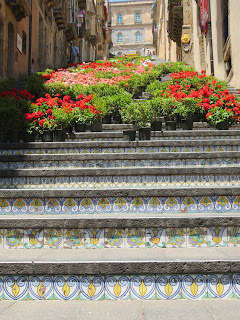 As if the climb to the top were not enough the city fathers have contrived to underline the verticality of their environment with a ceramic and botanic decoration of an ancient staircase by the village’s center, right down from Via Luigi Sturzo. the “Scala di Maria del Monte.” The scala, which has 142 steps, itself dates from the 17th Century, but the ceramics were inlaid in l954, and are a testament to traditions of regional artisanry that date back to the Middle Ages. 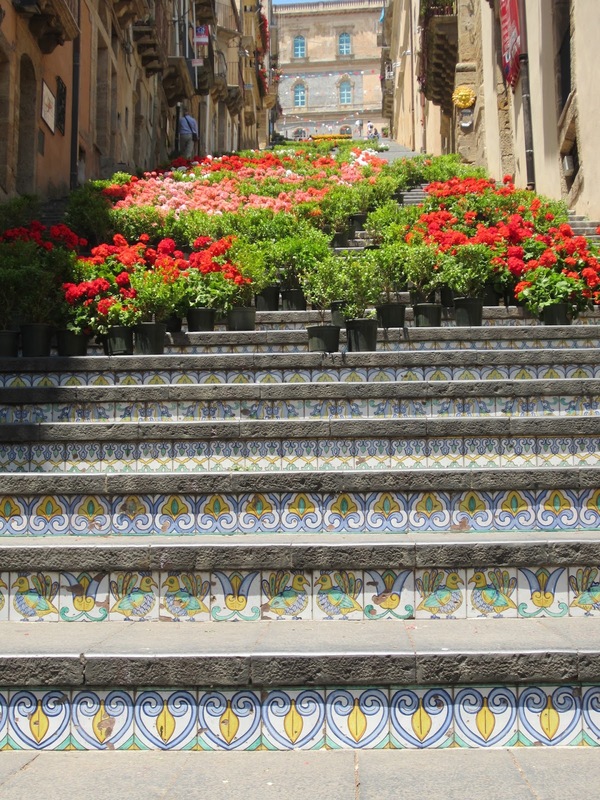 Few visitors who have made the climb to the top of Caltagirone will have the energy to ascend this magnificent staircase--essentially a stairway to heaven.